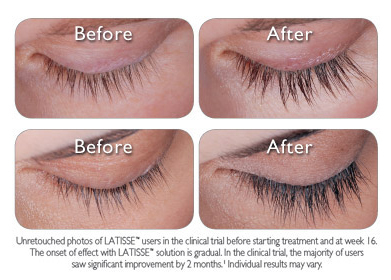 Latisse, an FDA-approved product has been formulated to increase eyelash growth. GROW LONGER, FULLER, DARKER Lashes with this easy to apply, prescription treatment for enhancing eyelashes. 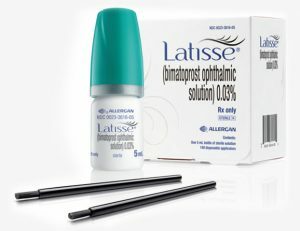 Latisse solution is a once-nightly treatment you apply topically to the base of your upper eyelashes. Then, gradually, the results come in. You may start to see more length in as little as 4 weeks and you should achieve full growth in 16 weeks. It’s not an illusion of growth. It’s real lash growth. Latisse works from the inside out. 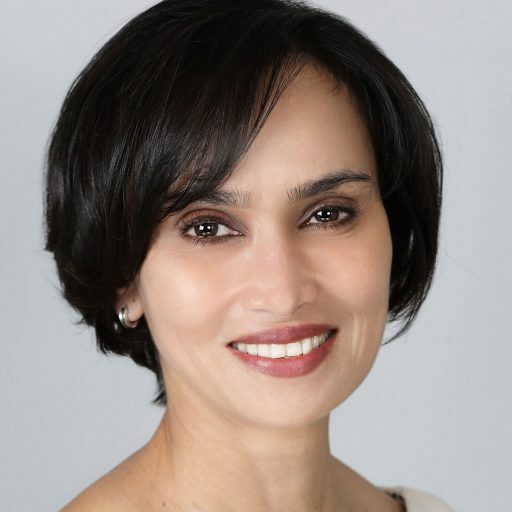 As the treatment progresses, you’ll first begin to see changes in length. Then, gradually, you’ll notice more thickness and darkness in your lashes. If you’re satisfied with your results by week 8, don’t stop there. Stick with the treatment. After week 16, you’ll see the full effect of Latisse.